​Navy SEAL, Kason “Benny” Sawyer’s family has exploded. A wife and three kids in just three years has him hopping, especially when he can be called away at a moment’s notice to parts unknown. With the cost of his wife’s new business, and repairs on the farm house mounting, his debts have him scrambling to make ends meet in his crazy, busy life. And that life is about to get crazier when he finds out Jessyka has entered him as a contestant on The Cook Off, cable TV’s hottest new cooking show. The prize is 150,000 very tempting dollars. There’s just one problem—the rivalry for the grand prize seems to be getting heated outside of the kitchen as well. 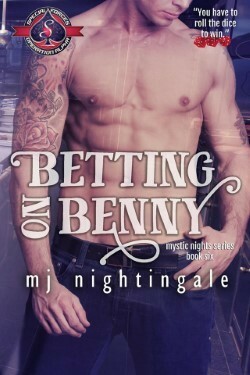 When strange accidents start happening at the casino in Mystic, CT where the show is being filmed, Benny’s protective instincts are “kicked” into high gear. Will Benny be able to take home the win to help his family? Will he be able to figure out who is sabotaging The Cook Off and causing these dangerous accidents? And will this SEAL survive the mayhem in Mystic, protect Jessyka, and his entire family, too?